Yoga means “to yoke” or “to unite”—to know oneself as one with all that is. Yoga practices are a means to overcome avidya, the ignorance that distorts one’s perception of oneself and others. Using asana as a method to attain Self-realization or enlightenment means exploring the true, practical, physical meaning of the term asana as “our relationship to the Earth”—that is, to other humans, animals, plants, things, the planet itself and all of manifestation. What could be more physical than what we eat, where we live and who we live with? The fork can be an instrument of world peace or a weapon of mass destruction. If we ourselves want to be happy and free, then how can we attain that goal if we cause others unhappiness or deprive them of their freedom…or their lives? Animals that we raise for food are slaves, deprived of all of their rights and respect as persons and ultimately killed, merely to satisfy our appetites for meat, dairy, eggs, leather, silk, wool, etc. The fundamental ethical precepts of yoga (the yamas) teach that if we want to be free and happy, we should not harm others, we should not lie to others, we should not steal from others, we should not misuse others sexually and we should not be so greedy as to leave others impoverished. The meat and dairy industries are based on all of these behaviors. We agree with Ingrid Newkirk, founder of PETA who says, “Animals are not ours to eat, wear, experiment on, use for entertainment or abuse or exploit for any purpose.” The best way to uplift our own lives is to uplift the lives of others, and making the choice to eat a plant-based diet and avoid the use of animal products in all areas of our lives is the single greatest act we can take to uplift the lives of others. As human beings we are one type of animal among many. Through the practice of veganism we can begin to experience how to live in harmony with our fellow Earthlings, who together collectively create this living planet Earth. I am at home in the entire universe. Whatever spiritual practice we are engaged in, it must address the environmental issues that our planet faces, or else our practice is irrelevant. The yogi strives to live in harmony with nature and to perceive all of life as imbued with consciousness. A yogi does not see him- or herself as living in the world, but rather sees the world as his or her own expanded self: the Earth does not belong to us; we belong to the Earth. What is realized in the enlightened state is the interconnectedness of all. It is our job to nurture and protect the Earth, as she is our own greater body; what we do to her we do to ourselves, and without her we have no physical existence. 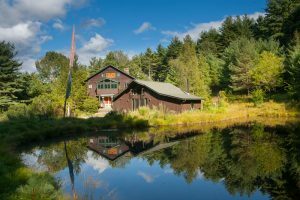 The Sanctuary serves as a safe haven and unpolluted habitat for diverse plant and animal communities, including white tail deer, black bear, foxes, porcupines, possums, raccoons, turkeys, as well as a large variety of wild birds, fish, snakes and other reptiles and amphibians. In present culture, the word wild is usually used to mean “chaotic” or “disorganized,” but the word actually means “living true to one’s nature; not restrained, controlled or tamed by others.” The quest for enlightenment is a quest for wildness—to return to the natural state in which we know ourselves as one with all that is and we live that truth fully. Sharon Gannon often teaches that we can have anything we want so long as we are willing to provide it to others first. 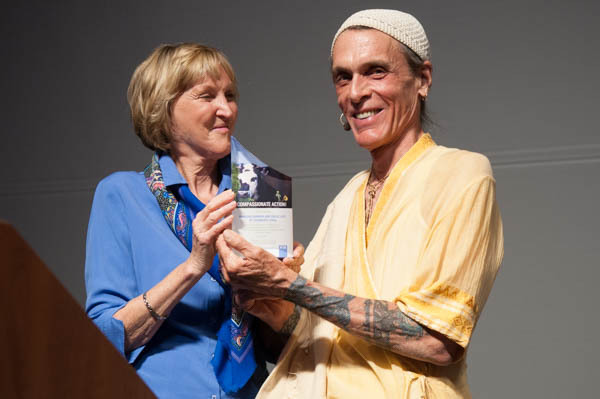 She and David Life live that teaching by having established and by maintaining the Wild Woodstock Jivamukti Forest Sanctuary, which is the country ashram for the Jivamukti Yoga School. These are two of our favorite charitable organizations. Please consider donating money to them and supporting them in any other ways you are able. Founded by Sharon Gannon and David Life, together with Janet Rienstra of Meta Records, Animal Mukti is a free spay and neuter program of the Humane Society of New York. Prior to the founding of Animal Mukti in 1999, approximately 100,000 cats and dogs in New York City died needlessly each year, 40,000 by euthanasia and the rest by neglect, abandonment and abuse. Since its founding, Animal Mukti has helped reduce the number of needless deaths by approximately 37%. The Humane Society of New York helps more than 30,000 dogs and cats annually by offering professional veterinary care 365 days a year, as well as shelter and adoption services. The Humane Society has long been noted for its innovative, highly individualized approach to animal care. The quality of each animal’s life is paramount and the Humane Society is dedicated to finding just the right, responsible and reliable home for each animal in its care. The Animal Mukti program relies on donations to continue offering free spay/neuter services to all. PETA focuses its attention on the four areas in which the largest numbers of animals suffer the most intensely for the longest periods of time: on factory farms, in the clothing trade, in laboratories and in the entertainment industry. We also work on a variety of other issues, including the cruel killing of beavers, birds and other “pests,” as well as cruelty to domesticated animals. PETA works through public education, cruelty investigations, research, animal rescue, legislation, special events, celebrity involvement and protest campaigns. For more information, please visit to http://www.peta.org.